After spending a relaxing week with new family and friends in Patrick’s home state of balmy Virginia, I find myself back in frigid New England, snowed in. While defrosting chili from the freezer, I rummage through my cabinets to come up with a cozy, warming one dish dinner while watching college football. With southern cornbread on my mind with a Cajun kick, I layer the creamy batter atop spicy chili in a cast iron skillet, topped with melted cheese.The blended flavors transport me back south and away from the fluffy white snow of Pomfret. Over medium high heat, heat a large pot with 1 T EVOO. Add the chorizo and render for 2-3 minutes. Add the turkey and let brown, crumbling with a wooden spoon for 4-5 minutes. Add the onions and peppers and cook for 5-6 minutes.Stir in the spices (chili powder, cumin, cinnamon and oregano). Add the garlic and beans and cook for 2-3 more minutes. Pour in the beer and reduce for 1-2 minutes then add the tomatoes and chicken broth. Season with salt and pepper and reduce heat to low. Let simmer on the stove for 20 minutes. Pour into a 10-inch-diameter 2 1/2-inch-deep cast iron skillet when ready to bake. Sprinkle with 1 c grated pepper jack cheese. Meanwhile, prepare the corn bread topping. Preheat oven to 400 degrees Fahrenheit. In a food processor, puree the thawed corn kernels and pour into a large bowl. In a separate bowl, whisk together the flour, cornmeal, baking powder, salt, chili powder and paprika. Add the milk, melted butter, egg, and honey to the bowl with the corn and stir to combine. Stir in the the corn puree to the flour mixture and stir just until blended. Stir in 1/2 c grated pepper jack cheese. Spoon the cornbread batter atop the chili and spread evenly to cover. 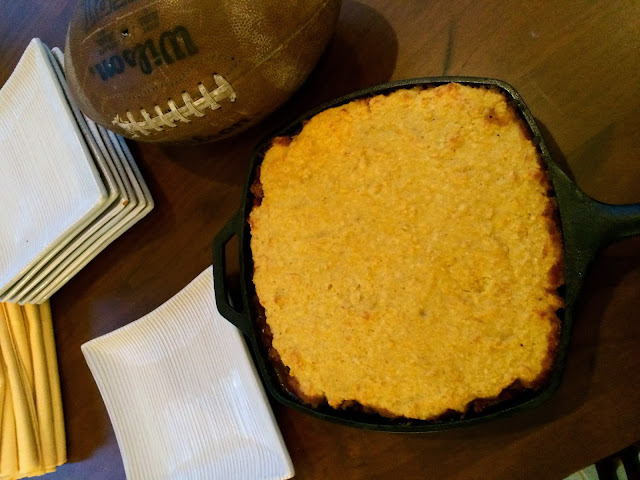 Bake the tamale pie until the cornbread topping is golden brown and firm, about 35 to 40 minutes. Spoon the tamale pie onto plates with sour cream and sliced avocado. Serves 6-8. Instead of putting together a lasagna or stew for a group of guests, try entertaining with this impressive layered dish!